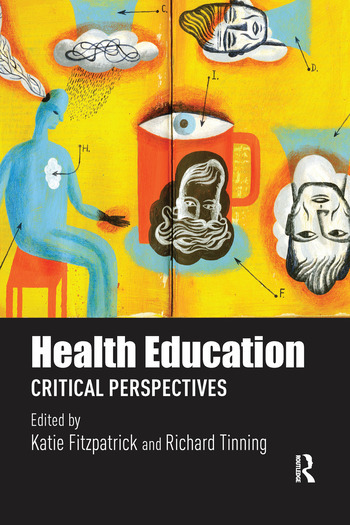 Considering the Politics and Practice of Health Education Katie Fitzpatrick and Richard Tinning Part 1: The Politics of Health and Education Health Education and Health Promotion: Beyond Cells and Bells Doune Macdonald, Rebecca Johnson and Anthony Leow. If You Are Not Healthy, Then What Are You? Healthism, Colonial Disease and Body-Logic Brendan Hokowhitu. The Reproductive Citizen: Motherhood and Health Education Deborah Lupton. Schools, the State and Public Health: Some Historical and Contemporary Insights Michael Gard and Carolyn Vander-Schee. Who has Health Problems? Class, Racialization and Health Symeon Dagkas Part 2: Inventing Youth Health Issues Tau(gh)t Bodies: Student Sexual Embodiment and Schooling Louisa Allen. Young People, Alcohol and a Social Science of Risk: Bauman and the Problem of Ambivalence Peter Kelly. Social Media: Virtual Environments for Constructing Knowledge on Health and Bodies? Karen Sirna. Mediating Bio-Power: Health Education, Social Class and Subjectivity Laura De Pian, John Evans and Emma Rich. The Corporatization of Health Education Curricula: ‘Part of the Solution’ to Childhood Obesity? Darren Powell. Mental Health in Corporeal Times Lisette Burrows and Margaret Sinkinson Part 3: Against Healthism: Shifting Educational Practices Critical Approaches to Health Education Katie Fitzpatrick. Salutogenic Approaches to Health and the Body Mikael Quennerstedt and Marie Öhman. Getting Which Message Across? The (H)PE Teacher as Health Educator Richard Tinning. Disrupting the Field: Teacher Education in Health Education Deana Leahy and Louise McCuaig. Beyond Body Fascism: The Place for Health Education? Jan Wright. Katie Fitzpatrick is a Senior Lecturer in Health and Physical Education in the Faculty of Education at the University of Auckland, New Zealand. She has published in the areas of multicultural education, research methodology and health and physical education, as well as previously being an experienced high school teacher and national policy developer. Richard Tinning is Professor of Physical Education in the Faculty of Education at the University of Auckland, New Zealand, and Professor of Pedagogy and Physical Education in the School of Human Movement Studies at the University of Queensland, Australia. Richard was one of the early advocates of critical pedagogy within physical education and has written extensively on teacher education for HPE and the relationship between physical education and health education.